Deb's Cup of Tea: I really want to go to this. I don't have cable so I have to watch the efforts of Jon Steward and Stephen Colbert on Comedy Central the day after. If ever you wanted examples of how to use language, via hyperbole, sarcasm, metaphor and doublespeak, to poke fun at us, these two are at the epitome. There isn't a cow that is sacred and, in punching those "cows", I like to think they show us our foibles and maybe get a few people to think. Love them or hate them, the sharp, sharp writing on each show characterizes a love for language and a willingness to explore every territory. Cross the line? Of course. But that's what pundits should be doing. It was with increasing excitement that I watched the announcement this morning about Jon Stewards "Million Moderate March". You can read about it here but please do yourself a favor and watch the 11 minute announcement. All the hyperbole and laughter aside, Stewart is making what I firmly believe is a point lost in these troubled times. Discourse and dialogue are almost dead. We don't engage each other in conversation to find out how we feel about issues. We drag our soapbox to the corner and scream, "Are you listening to me?" It's not about finding common group anymore. It's about "my way or the highway". You accept my position or you're garbage. I tend to bury my head in the sand when it comes to politics. I probably shouldn't. There are things I believe and support and there are things I don't believe and won't support. It's just that by taking a stand in this current political climate, you risk having people less informed scream obscenities at you. I just don't care to be exposed to that. Steward is right, I think, in stating that 80% of Americans want it to just go away. I think a majority of us are tired of the screaming at each other from both sides. We may take what the Glen Becks or the James Carvilles have to stay to heart but we're tired of being yelled at. We'd really rather sit down with one another, have some coffee, tea and a slice of cake, and decide whether the military needs another plane. We're used to making compromises in our lives and we can't understand why we can't all just get along. It's okay to have diverse opinions. We learned that when we were founding this country. But we also learned we can't go ahead if we're being pulled at both sides. I remember Dr. King's March on Washington and the subsequent marches using the National Mall as a platform for rhetoric and fervor. "Ooooh, that might be fun to be a part of," I thought, but never really wishing for a 15-hour bus ride to stand for 3 hours and listen to speakers. This, however, makes me wish I could. 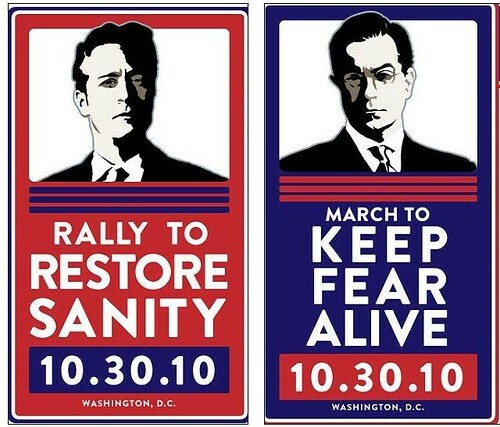 "Restore sanity" is a nice idea. If it would get people talking to one another, that's what would be extraordinary. Then again, maybe that's too much to ask for a country so divided.